Description: When working on street rods, it may be necessary to lift heavy objects. Many back injuries have occurred because the street rod enthusiast did not lift a heavy object properly. The recommended position is shown in the illustration to the left, Always follow the suggestions below when lifting any heavy object. Consider the size, weight, and shape of the object, and get help if necessary. Set feet solidly, with one foot slightly ahead of the other for stability. Keep the back as straight as possible and bend the legs. 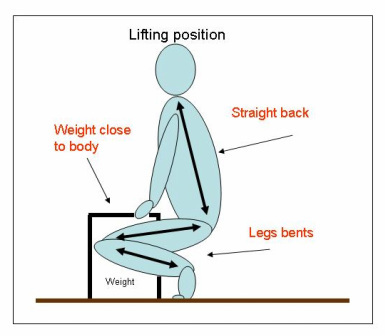 Straighten the legs to lift the object, bringing the back to a vertical position and do not lift with the back. Never carry a load you cannot see over or around. Setting down the object requires the reverse procedure. Use mechanical lifts whenever possible.